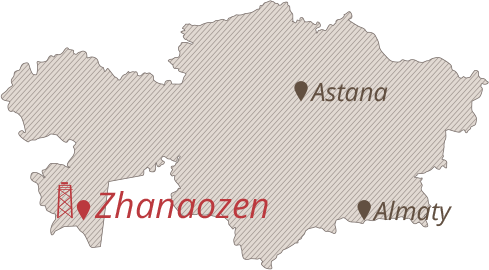 In the Kazakh language, Zhanaozen means ‘new river’. In 2011, this town, located in the desert, became a symbol of hope for political change in Kazakhstan. For the first time in over twenty years of independence in Kazakhstan, oil workers began mass protests against exploitation and dictatorship. previously, they only listened passively to the voices of discontent coming from the intellectual elites of Almaty and the independent media. The strike broke out in the fuel industry, which is integral to the country’s economy. despite the peaceful form of the industrial action, the authoritarian government failed to enter into dialogue with the strikers. In order to suppress the protest, security services used provocation, beatings carried out by “unidentified attackers”, social pressure, staged accidents and detained oil workers and activists. In december 2011, the strike was stopped by means of force. The tragic events in Zhanaozen seriously undermined the credibility of president Nursultan Nazarbayev. In 2012, workers of steel mills and coal mines in Karaganda, Temirtau and other regions of the country also went on strike. The image of Kazakhstan – the oasis of stability and leader of reform in central Asia, created by the authorities, has been tarnished, and the opposition have fresh arguments in calls for greater solidarity with the persecuted persons. © 2019 Open Dialog Foundation. All rights reserved.